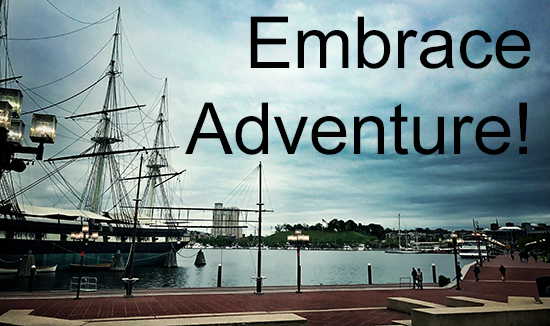 I'm in Baltimore this week for DrupalCon. The opportunity came up just a couple weeks ago. My boss asked me if I wanted to go. My first thought was about the long drive and my cat maybe starving and my training and other bull$hit. And then after a few seconds I thought, "Ummmmm, I'm stupid; of COURSE I want to go." A paid trip to Baltimore? Yes please! I got to run Boston last week in pretty much the same way. The opportunity popped up a couple weeks prior. And my immediate reaction was that it's scary, and far, and what about my training? And then followed by the inevitable, duh! Of course! I'm not a spontaneous guy. I know these examples make me sound like a whirlwind of nonstop action, but I'm actually a lazy homebody. I prefer to do the things I usually do, followed by sitting around at home doing nothing. I like to know what I've got going on, and to have the time to pad that thing with laziness. It's like a sandwich, where laziness is the bread. That may not make sense at first. But laziness is just about comfort. Adventure is about stepping out of that comfortable area. And that's something I try to do regularly. I do that every day with my training: Pushing myself outside of my comfort zone. Because as much as I enjoy lounging around, I don't want to get trapped in that bubble of safety. I was tired yesterday after driving for 5 hours. There was some whacky traffic. I saw a sign that said, "Aggressive drivers high accident area." Seriously? And then after I got here I had to check into my hotel, find a parking garage to leave my rental in, and then go spend a few hours at the Con. But once I finally got back to my room, the first I did was throw on my running clothes and run 8 miles along the Inner Harbor. It was a gorgeous run, despite the threatening rain clouds. I even recognized some parts from the Baltimore Marathon I ran 6 months prior! Some of the other Con-goers were probably still drinking beer. I used to think that was an adventure, drinking in a difference place. But that's just more comfort. Navigating the world stone cold sober is way scarier. Running across busy intersections and around a completely unfamiliar place is an adventure! It's something I used to force myself to do, to expand myself as a human being. But now I relish it; I try to seize every opportunity I can. Training is about adventure. 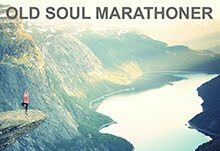 Because at the end of the training, I get to go somewhere, meet some cool people, explore some new scenery, and then do a crazy race! 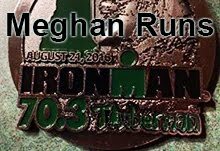 The Ironman I'm doing in August is in Quebec! I need, like, a passport to get there! The Con is cool too. Today, I went to a session titled "Dungeons & Dragons & Drupal." Yes, I'm a super nerd. There's a large expo that runs every day where you can drink coffee, collect stickers and other freebies, watch them make you a silk screen shirt on the spot, and play ping pong. I watched a demo at the Pantheon booth by a guy wearing a large purple hat. I got yelled at by a woman with a thick European accent because I sneaked in before it was officially open yesterday. I try to be conscientious of my fears. And every time they crop up, I face them head on immediately. That's the path to growth and improvement. It's too easy to get lulled into complacency. To decide that your life is "good enough" and just settle in with beer and ice cream. It's very powerfully attractive. We're built that way as humans. Scary things used to eat us. So we would prefer to be safe and comfortable. To venture out only when it was necessary. But now we have the luxury to choose to venture out. To face fears our ancestors fled from. To push ourselves beyond our limitations. To explore the very boundaries of our identities. And it's terrifying. But in those moments when you're far outside of your comfort zone and nearing the edges of the danger zone... Those are the moments when you truly discover yourself. Seek adventure, and you will find yourself.